Despite Chicago’s sports and racial history, we believe yes we can! “I think we were the only black people there,” my wife said as we were leaving Wrigley Field a few weeks ago. The sentence jarred me a bit, first because it interrupted my reverie after experiencing a rare Cubs playoff victory, and second, because it forced me to realize, once again, that I am a member of a small club. Yes, I am a black Chicago Cubs fan. Now, any other black Cubs fan who’s reading this is probably excited to find that there’s another one. Walking down the street in Chicago, wearing a Cubs hat (especially during the offseason) and encountering another black man wearing a Cubs hat is a bit like finding another American wearing the same college sweatshirt overseas. There’s a sense of camaraderie, connection and a little bit of shock. Overseas, you have to say something to one another, a greeting and a few words from the old fight song, learning the outlines of each other’s connection to the school. In Chicago, two black guys who don’t know each other aren’t doing any of that. But there’s a head nod and maybe after a big win — so rare that there really hasn’t been a ritual developed — an occasional fist bump. Let’s just say it is rare. But why? 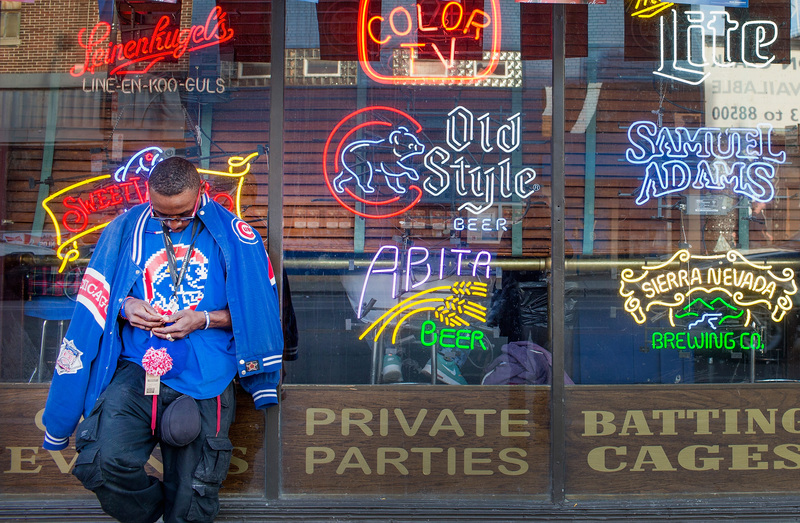 David Lee Cook listens outside a bar across from Wrigley Field as the Chicago Cubs play the St. Louis Cardinals in game four of the NLDS championship series at the park on October 13, 2015 in Chicago, Illinois. First, there’s geography, neighborhood geography, and in Chicago, neighborhood can be destiny. For the uninitiated, Wrigley Field is on the North Side of Chicago. More accurately, Wrigley Field is in the North Side of Chicago. It’s a part of a neighborhood. That’s part of its charm. You can’t really even see it until you get up close because it’s embedded in the community, obscured by the buildings and homes that surround it. And before they put up the lights to allow the Cubs to play night baseball at home, you almost couldn’t see it until you were a block or two away, or turned the corner. When I was young, that was one of the best moments of my childhood. Riding the “L,” or the bus, or sitting in the back seat of the car, and slowly approaching, and knowing it’s just a few blocks away, and boom, there it is. Wrigley Field, home of the Chicago Cubs. Baseball was my game, and the Cubs were my heroes. My mother was born on the South Side of Chicago, and we moved to the North Side when I was still in diapers. She had remarried an immigrant from Eastern Europe, my adoptive father, my dad, Juris. And they decided to move into the same home as his parents, a beautiful old house in the Uptown neighborhood. It was affordable, safe, and as an immigrant neighborhood, probably a bit more comfortable for an interracial couple – a tough thing to be in the 1970s in Chicago. But while we were with my father’s side of the family up North, my mother’s side all lived on the South Side. I was born in Chatham, where my parents grew up, a leafy, working and middle-class neighborhood on the South Side of Chicago. Through redlining, public policy, custom and comfort, Chicago’s black community filled in the black belt south of downtown, from the Great Migration of black families escaping the Jim Crow South to those piled into the infamous housing projects of the era of “urban renewal.” My grandfather worked in the public school system, my grandmother was a school crossing guard, and they were able to buy a home in the same neighborhood that Mahalia Jackson settled in, the same neighborhood that is almost a quintessential example of white flight. And my grandfather, and everyone else I knew, was a Sox fan. The Chicago White Sox play in a new stadium that is called some terrible thing, but when I was growing up, they played at the same site in Comiskey Park. And Comiskey Park is located in the South Side of Chicago. It used to be more tightly embedded in the neighborhood, but things have changed. There’s a new stadium surrounded by surface parking lots, and a big expressway right next to it, the legacy of the first Mayor Richard Daley’s desire to separate his Bridgeport neighborhood from the black belt with the Dan Ryan Expressway. But don’t be fooled as you approach it, because the White Sox are in and of the South Side. When I was growing up, we knew that neighborhood as a white ethnic enclave that was hostile to outsiders – and especially black people. Still, as long as they were going to the game – and leaving immediately after the game – South Side black folks went to the White Sox games, and were Sox fans. Then, the 1990s came, and N.W.A. transformed my generation’s identity through sports teams that wore black. Mostly the Oakland Raiders, and later, the White Sox. Meanwhile the Cubs seemed to embrace losing, and Wrigley Field became known as the drunken playground for yuppies. And all of a sudden, my Cubs hat said that I (a) was some privileged North Side kid, (b) rooted for a historically terrible losing team, and (c) was not black enough. I took the ribbing and wisecracks. And then, I helped elect Barack Obama to the White House. A South Sider. A White Sox fan. The ribbing and wisecracks moved into the context of working for the leader of the free world, the first black president, the man who took out Osama bin Laden, the tribune of black cool. Yes, we had other Cubs fans in Obamaland. And even a brother or two who worked with me formed a bond around our shared double identity. Still every year, the Cubs lost, never even getting to the World Series, and often losing in painful fashion. But I never lost faith. Why? Because to me, there’s nothing blacker than being a Cubs fan. You see, I was taught that my story, the story of being black in America, is one that acknowledges, studies, and never forgets the struggle and loss in our past and present. The Middle Passage, the Underground Railroad, the horror of chattel slavery, the terror of the Klan, and the degradation and debilitating power of Jim Crow, and explicit and implicit systematic discrimination and bias. These things are real. They represent and are experienced as pain, suffering and loss. These experiences are part of my identity as a black man alive in 2016. I refuse to ignore it, pretend it doesn’t exist or didn’t happen, or try to wish it away. 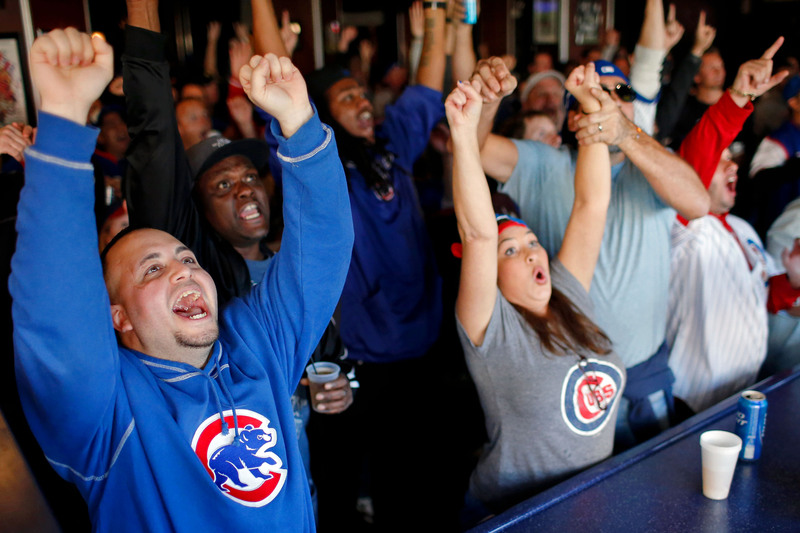 Chris Jacobson of Chicago (L) and Chicago Cubs fans celebrate a three run home run by Javier Baez #9 of the Chicago Cubs (not pictured) during the second inning of Game Four of the National League Divisional Series between the Chicago Cubs and St. Louis Cardinals while watching the game at the Cubby Bear on October 13, 2015 in Chicago, Illinois. But I also know that I stand here in a different place from my parents and those who sacrificed and bled for us. My friends lead this country from the highest office in the land. I have a beautiful and brilliant wife, amazing kids, and a rich family tradition, with love and kindness in my life from people of all races, colors, and creeds. As a people, we have made incredible progress, and as a family, we have overcome so much, and are making this a better world, moment by small, almost imperceptible moment, every day. So I have hope. And even though being a Cubs fan means rooting for a team that has lost a lot, I know that every year there’s a new season, and every game, there’s another chance to win. The Cubs have finally made it to the World Series. I was in the stands in Wrigley Field to watch the Cubs clinch the pennant and when the ball hit Anthony Rizzo’s glove for the final out, surrounded by a few friends from the Obama White House – men and women, and black and white – we cheered and hugged, and without warning, my eyes teared up a bit. Despite our history, but more so, because of our history, I have hope. Michael Strautmanis is a public affairs strategist who has led outreach and civic engagement programs in the public and private sectors. He has worked for President Barack Obama since his U.S. Senate campaign in 2004, first meeting the Obamas when he was a young law student more than two decades ago. Strautmanis, married and a father of three, is home in Chicago to serve as vice president for civic engagement at the Obama Foundation, a nonprofit established to carry on Obama’s unfinished project of renewal and global progress.